Captain, an officer and the department's community outreach specialist awarded. Three law enforcement officials with the Forest Grove Police Department were recently recognized for their commitment to their community — going above and beyond for the people they serve. Officer Andrew Colasurdo, Capt. Kevin Ellingsburg, and community outreach specialist Lauren Quinsland received awards during the 49th annual Oregon Peace Officer's Association awards banquet on Nov. 30. Law enforcement agencies and community members are encouraged to nominate people they feel have gone above and beyond to assist and protect their community for one or more of the various awards. 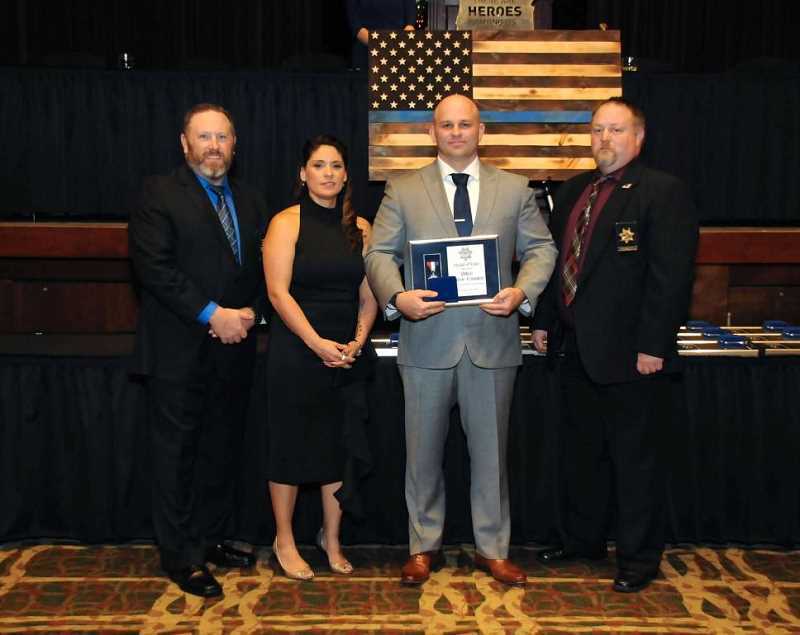 The OPOA then determines whether that individual has met the criteria for the given award, and if so, they are granted it during the annual banquet, said Elsa Navarro, senior deputy with the Marion County Sheriff's Office and president of OPOA. Colasurdo was awarded a Medal of Valor, which is given to "individuals who, while serving in official capacity, with their law enforcement agency, distinguished themselves by reacting to a situation in a positive, professional manner and thereby reduced the risk of loss of life or injury to citizens," Navarro said. "It should involve incidents of exceptional bravery," said Navarro of the criteria. "It may involve incidents that the officer just did the job that had to be done, but did it in an extremely professional manner." Colasurdo was off-duty at a restaurant in Scappoose on June 10, 2018 — with his then-fiancee, on their way to get married, according to a statement from the OPOA — when he noticed two Oregon state troopers on a traffic stop outside. One trooper had taken the driver of a vehicle into custody and was escorting him to his patrol vehicle, while the second trooper stayed talking with the passenger. "Unbeknownst to the troopers, the passenger had planned on attacking them to take the one their firearms, and to provoke the troopers into a deadly force situation," the OPOA stated. The passenger, described as a 6-foot-5, approximately 300-pound man, got out of the vehicle and was behaving in an "agitated" manner, prompting Colasurdo to come out of the restaurant to assist, according to the association. The passenger then headbutted the trooper and punched him several times, knocking him to the ground. Announcing himself as an off-duty police officer, Colasurdo assisted the two troopers in neutralizing the man and taking him into custody, the OPOA said. "Officer Colasurdo's selfless act that day prevented the serious injury or death of the troopers," the association stated. Capt. Ellingsburg was awarded the Distinguished Service Award during this year's banquet. Ellingsburg has served the City of Forest Grove for the past 25 years, the OPOA said. Prior to that, he served in the U.S. Army as a cavalry scout. The Distinguished Service Award recognizes Ellingsburg's career in law enforcement and his leadership as a police captain. "His life experience in all these areas has made him the man he is today," the police department's nomination of Ellingsburg for the award stated in part, "and his position as a captain within our department has benefited us greatly." Ellingsburg continues to lead by example, the nomination said. 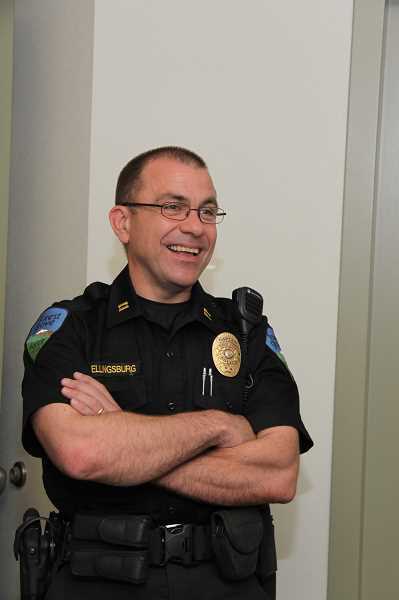 "Captain Ellingsburg displays extremely effective leadership skills through his belief in leading by example," the OPOA read during the banquet. "Captain Ellingsburg excels in coaching and counseling. He corrects without criticizing and copes effectively with misunderstandings all while continually showing a strong professional concern for the quality of the work from his officers and of himself. ... The captain provides a personal example to our department in assisting officers to remember why we, as law enforcement officers, do what we do." Ellingsburg serves as an inspiration to many in his department, the nomination said: "The Forest Grove Police Department cannot think of a better person, a better officer, to be recognized for his service to what is the most honorable profession in the world. We serve because we have heart and Captain Ellingsburg has shown his heart to do the right thing, for the right reason, at the right time. For this we want to thank him." 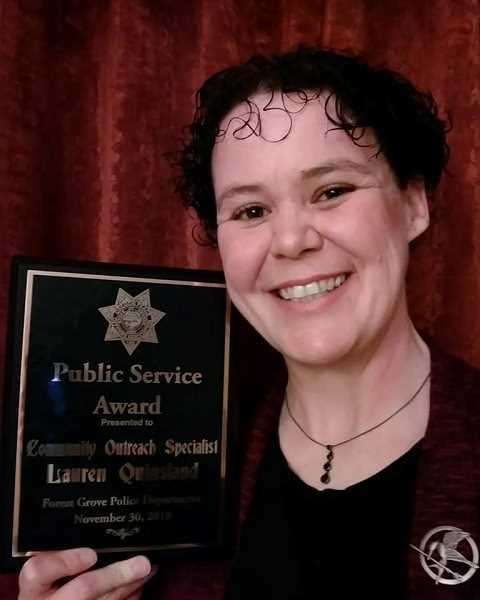 Quinsland, who has served as a community outreach specialist for the Forest Grove Police Department since 2015, was recognized as a recipient of the Public Service Award during this year's banquet. "Lauren has taken her position to a whole new level," Quinsland's nomination statement reads in part. "Lauren coordinates the Citizen's Academy, Coffee with a Cop, National Night Out, Social Media and Scam Workshops. Each year she continues to make each of these programs more relevant through research and community involvement, thus making each event a huge success and has fostered very positive support from the citizens." Quinsland manages the department's social media. "Her social media efforts have garnered great attention from the community and enhanced awareness to community issues," the department said in nominating Quinsland for the award. "The Scam Workshops were non-existent prior to Lauren assuming her role. She has developed this program and routinely hosts these forums which receive wide acclaim from our citizens, focusing efforts on vulnerable adults to include traveling to care facilities to put on classes." A recent marketing analysis group noted that the Forest Grove Police Department has a very positive reputation and image within the community, the nomination read. "One of the most noted attributes was the level of transparency. This is greatly credited to the efforts and effectiveness of Lauren's community outreach," it added. "She is often ahead of trends and ensures her community is aware of who serves them and the great things they are doing. ... Her outreach and volunteer efforts combined make her an invaluable member of the Forest Grove Police Department and her community."